Discounted quality professional development at our Annual Conference, which brings national leaders in school counseling to Oklahoma. Free professional development on the OSCAR, TLE and ASCA Model at our annual Summer Institute. An opportunity to participate in the annual School Counselor of the Year event. An opportunity to be recognized for achieving an OSCAR. A quarterly professional newsletter specific to Oklahoma school counselors. Communication regarding innovations in the school counseling field. Collaboration with the Oklahoma State Department of Education. 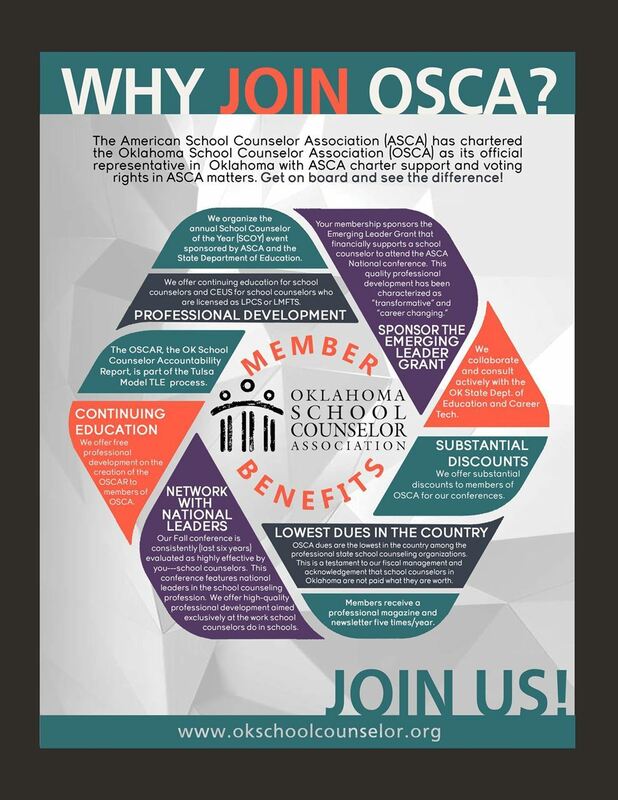 Training through the American School Counselor Association, since OSCA is the only state-chartered ASCA organization in Oklahoma. Pride in the knowledge that your membership fees support a scholarship for a graduate student in school counseling. Leadership that is informed through involvement with ASCA, including annual attendance of Board members at the ASCA Leadership Development Institute. An opportunity to apply for an Emerging Leader Grant that supports attendance at the American School Counselor Association (ASCA) Annual Conference. An opportunity to apply for the RAMP Scholarship which supports Oklahoma School Counselors achieve the recognition of running an ASCA RAMP school counseling program ($400.00 dollars will be paid to ASCA on the recipient's behalf).